I have 3 finishes this week. Woo Hoo! It finished up at 50 x 80. Perfect for a big boy bunkbed. My favorite part is the big-stitch quilting in the stars. I wanted to mimic the look of the red stitiching on baseballs. 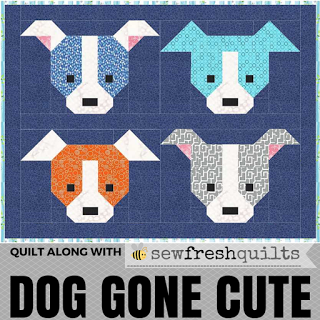 Super cute and adds a nice feel to the quilt. I backed it with a simple tone on tone blue and bound it with a scrappy red binding. Here is a detail of the stitching on the back. I hope Evan loves it and enjoys it for years! Next up is a comfort quilt made from the scraps of Evan's quilt. I had about a 1/4 yard each of the two baseball prints left when I was all done. Rather than let them sit unused for years in my stash, I decided to use them for my October comfort quilt. I was able to get five 8 inch squares from each. I cut as many 8 inch squares as I could from the remaining fabric and then used the smaller pieces to make some patchwork blocks. I was trying to be resourceful and I just LOVE the results! I'm telling you that scrap quilts just make my heart sing. I was only 4 blocks short so I cut into my red chevron to finish it off. The quilt finished at about 45 x 45. I nice sized little boy quilt. I machine quilted about 1/2 inch on either side of each seam. The back is pieced from a large strip trimmed off of Evan's backing and some large pieces of fabric that have been lingering in my stash for too long. I love a pieced backing. I think it makes the quilt more fun. I'm still working on my machine quilting, I am a hand quilter by choice, but I am learning. Finally, my red and white quilt. The top was finished in January of this year and quilted this summer. Sadly it has just been sitting and waiting on its binding. This week the binding was completed and I have a finished quilt ready for Christmas/Valentine's Day. She's a beauty. The linen gives it such a nice feel. Look at those amazing dots on the back of this quilt. You cannot go wrong with dots. Ever. I finished it with a bright red binding of course. Three finishes in one week feels so good! excellent work - love them all! Lovely, lovely finishes and three in one week - wow!! Your red and white quilt is beautiful. Wow! All thtee are great! You have been busy! Beautiful finishes, well done! Wow! 3 finishes! The red big stitching is so great. Great quilts!